Interoperability is the capability of two or more networks, systems, devices, applications, or components to share and readily use information securely and effectively with little or no inconvenience to the user. What makes a standard interoperable? 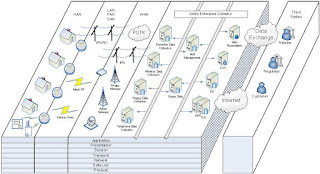 The Smart Grid should have a layered architecture. Layering is a winning principle of Internet development: Technologies develop independently at their own layer, at their own speed. Generality: each layer is an occasion for interface design, inviting generality. Standard interfaces and technologies can be developed and interchanged. It is now hard to imagine ATM cards that only worked at one bank instead of every bank, but that was the case at first. Now, each bank can have its own internal security and proprietary system in place, but with the open standards developed by the banking industry use one ATM card can withdraw or deposit funds from almost anywhere in the world. Similarly, it is hard to imagine cell phone customers who could not speak to any other cell phone company customer or land line. If each cell phone company prevented the free flow of the signals from one cell phone system to the other, the telecom technology boom of the last quarter century would have been seriously impaired. Composition - Building of complex interfaces from simpler ones. Layers Systems - Separates functions, with each layer providing services to the layer above and receiving services from the layer below. 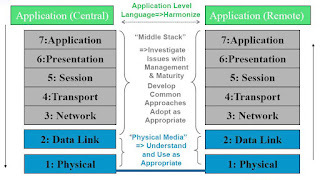 OSI Model - Open Systems Interconnection Reference Model - Sometimes called the seven layer model- An abstract description for layered communications and computer network protocol design. In its most basic form, it divides network architecture into seven layers which, from top to bottom, are the Application, Presentation, Session, Transport, Network, Data-Link, and Physical Layers. A layer is a collection of conceptually similar functions that provide services to the layer above it and receives service from the layer below it. Understanding and applying layering helps avoid placing unnecessary restrictions on one layer because of the implementation of adjacent layers. The physical layer is the media by which bits are exchanged. The data link layer (e.g., media access control or MAC) is where the exchange of frames (many bits) is performed. The network layer is the level where paths are determined and logical addressing is applied for packets (many frames). The Transport layer forms end-to-end connections and segments (many packets) are exchanged. The session layer deals with inter-host communication. The presentation layer deals with data representation and encryption. Shallow Integration - Does not require detailed mutual information to interact with other managed or configured components. Standards - Specifications that establish the fitness of a product for a particular use or that define the function and performance of a device or system. Standards are key facilitators of compatibility and interoperability. They define specification for languages, communication protocols, data formats, linkages within and across systems, interfaces between software applications and between hardware devices. Standards must be robust so that they can be extended to accomodate future applications and technologies..
Interoperability - When a new device is added to the system, interoperability will enable it to register itself in the grid upon installation, communicate its capabilities to neighboring systems, and cause the connectivity database and control algorithms to update themselves automatically. Communications - The message “packet” travels through the network correctly…right place/time and is capable of being understood by the application. Applications (aka inter-workability) - The contents of the packet are understood and the correct actions are performed by the application in the required time frame. Scenario - Applications/devices exchange and act upon “metadata” to perform system administration tasks… “plug and work” Emphasizes the pragmatic business and policy aspects of interoperation, especially pertaining to the management of electricity. Cyber Security is critical and must be managed over the life-cycle of the systems deployed. Cyber security is fundamentally about managing risk. Security must be commensurate with the vulnerabilities and exposures from any given application. Security must be considered at the time the application requirements are being developed since the domain experts are in the best position to understand what is at stake. Loose Coupling is a design tenet for scalable, high performance architectures, used in enterprise software and device component design today. Loosely coupled standards enable shallow integration of diverse technologies will be required for smart grid interoperability and to support diversity and innovation. Shallow integration, driven by the requirement for minimum knowledge, extends the reach of each standard, and enhances the value of composition. The market operations and load curtailment for (say) electricity and natural gas might be the same. Management. Symmetry is the principle that each action can run both ways: buyers of power at one moment can be sellers at the next. Symmetry is a fundamental characteristic of Net Zero Energy buildings. Integrating Distributed Energy Resources need attention to symmetry for energy flow and management. Transparency goes hand in hand with symmetry and the emergence of options in every market. Do you want to buy a certain class of power as part of a carbon strategy, in a multiparty marketplace? There needs to be a transparent and auditable chain of transactions showing that the markets actually cleared in each class of power. Seams – The boundaries between adjacent electricity related organizations. Differences in regulatory requirements, operating practices or data definitions may create seams problems. Compatibility - Avoid incompatible systems being fielded that result in costly replacements ahead of projections. Competition - Foster open access, competition and commercial growth of new technologies that offer energy consumers new ways to meet their energy needs while at the same time saving them money. Cost - Standards focus investment to lower costs, to increase value through connectivity. Innovation - Serendipity is encouraged, innovation accelerated. Testing - Standardization does not always result in interoperability. Unless the scope of a standard includes interoperability tests or guidelines, at best a technology would be in compliance with the standard. A dedicated user’s community needs to be tasked to identify interoperability requirements, write tests to validate products, and certify those results. Maturity - Applications are still being defined. The degree of openness and the balance with security concerns for the smart grid's communication and networking infrastructure still needs to be determined. Complexity - The number of stakeholders, range of considerations and applicable standards are very large and complex. The smart grid implementation has already started, and will be implemented as an “evolution” of successive projects over a decade or more. Monopoly Power - The old AT&T and IBM monopolies tended to move all their proprietary layers in lock step, which is one reason they were left behind. Stranded Asset - Legacy equipment that is rendered obsolete or uneconomical to operate. But it’s possible that we are in the process of stranding many new assets by installing them now, before standards are in place. What information is to be exchanged? What is the data to be named? Who is permitted to talk? What frequencies and signals are used? What the connector looks like?